Hallelujah for the darkness of night and sleep! Hallelujah for the visual quality of dreams! Hallelujah for our ability to rest, to dream, to swim with the snakes, and to mediate on their relevance! Hallelujah for our subconscious and conscious minds! "Can water moccasins swim under water and bite you?" was one of the questions that came up this past summer of 2016 in Albany, Georgia, at Jim Fowler's home and animal park. I was there with my Chiboogamoo in attendance with the Atlanta's Explorer's Club. A friend of Jim's was wrangling a rattlesnake he had found the day before and detained to show those of us who were visiting Jim's home for the afternoon and evening supper. 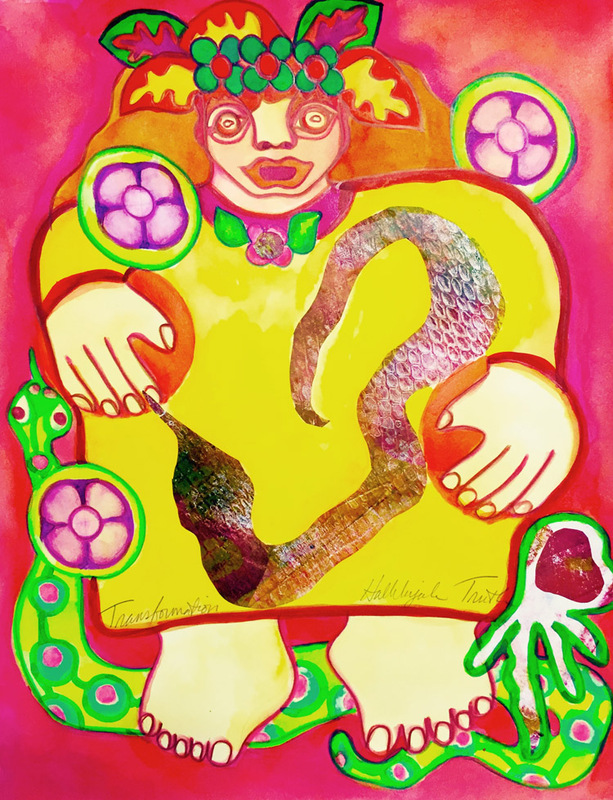 The snake was released later, but it left a big impression on my psyche, for the snake has been one of my dream totems since 1988 when I was turning 30 years old. "Anytime a snake shows up as a totem, you can expect death and rebirth to occur in some are of your life." Animal-Speak: The Spiritual and Magical Powers of Creatures Great and Small. When I was turning 30, my LIFE as I knew it was changing cataclysmically. Previously having earned my living as a writer, editor, and professional graduate student. Suddenly, I grew verbally silent. Then my thoughts started erupting in visual imagery--beginning with snakes! In my dreams, snakes the size of pine trees cluttered the pathways before me. Clearly, symbolic "death and rebirth" were taking place in my life! 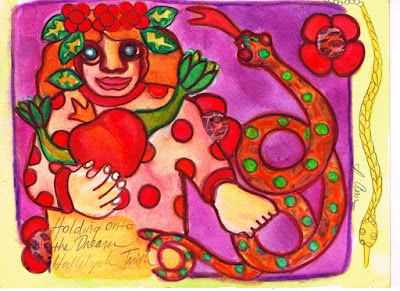 Instead of being grossed out, horrified, or intimidated by the appearance of the snake in my dream life, I embraced HER. 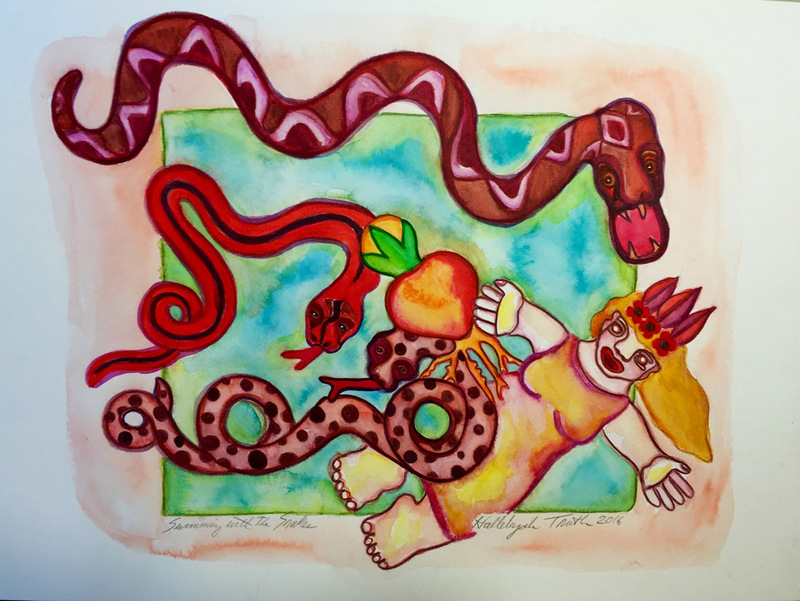 Researching snake symbolism and significance in other cultures, I determined I was fortunate to have "Snake Medicine" in my life! And, now, turning 58 years old (not far from 60), Snake Medicine is reasserting itself in my dreams. What am I to make of my "Swimming with the Snakes"? Yes, like most of us, I am always in the process of HEALING. And birthdays offer opportunities to review and assess where we are, what healing has taken place and what additional healing needs to occur. That's Coffee with Hallelujah! I invite you to SOUL BLOG with me and share your experience with dreams, understanding, and art making. 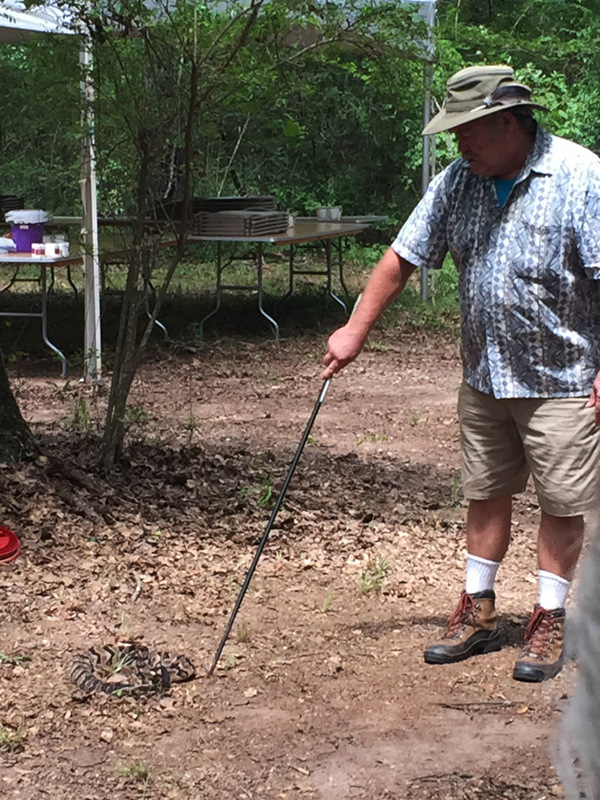 What do you know about SNAKE MEDICINE? ACKNOWLEDGMENTS: Big thanks to my Chiboogamoo whose sense of adventure takes us to places like Jim Fowler's home in Albany, Georgia, and other places where people talk about water moccasins dropping into boats and places dinosaurs have roamed. Thanks to Donna Mazzola, who I met at the InterPlay Leader's Gathering in Racine, Wisconsin, and who is leading an online class on playing with dreams. As a person who has working ongoingly with my dreams since I was in my early twenties, I appreciate having my community widen through friendship with those who study their dreams. As a visual artist (since my 30s), I have worked with my dreams in isolation other than when my blogging and art work bring me into discussion with others. Gratitude to Cynthia Winton-Henry who supports so many of us in finding ways to connect with one another.